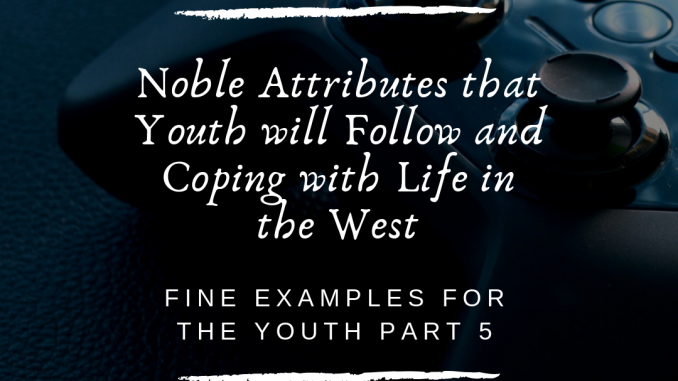 It is essential that we recognise traits that attract people to emulate and follow others so that we can inculcate within us a certain type of behaviour, sincerely for Allah, and become excellent role models for our children. Thirdly, people tend to follow dominant culture, especially if their own heritage is belittled and marginalised. And this is seen in Western (and Eurocentric) societies, where non-European culture, custom and behaviour, are seen as backward. So, the West raises a vanguard to defend, spread and enforce Western liberal thought and laws on all nations, and especially on the minority communities living in the West. It is therefore essential that young Muslims are taught about Islam and Islamic heritage so that know and understand the dominance of Islam in terms of its belief, its practices and its laws. Parents cannot expect their children to follow the life of the Prophet and his Companions and understand who they really were without exposing them to the Seerah (biography) of the Prophet (صلى الله عليه وسلم). Parents must take an authentic Seerah book and study it their children. But it’s not as easy as it seems because the works of Seerah require simplifying for younger children and explaining for older children. Nevertheless, this a must. Parents should teach children to be proud of their Religion, their faith and practice. Islam has a powerful and rich history; and its intellectual, spiritual and political dominance is a matter of record, but many parents and educators fail to convey this part of Islam to their children. Additionally, living in non-Muslim lands and learning history based upon Western interpretations that are further skewed by prevalent liberal ideas and thoughts can only lead to turmoil in the young Muslim minds and a progressively greater sense of inadequacy. This, in part, explains the recent rise in teenage Muslims opting to leave Islam in favour of atheism. Young people are ‘learning’ through state schooling, media, film and government propaganda, that Islam is not fit for this society because it does Islam not accept radical feminism, homosexuality and gender fluidity, it does not accept evolution as a scientific truth, nor does it believe that the earth orbits the Sun. “And hasten to forgiveness from your Lord and Paradise as wide as the heavens and earth, prepared for the righteous.” To whom has Allah promised this? Fifthly, start while they are young. The formative years of a child’s cultivation are very important. Teach them early, and they will hold on to what they learn, and they will not let it go, inshā’ Allāh. The Messenger (صلى الله عليه وسلم) obligated upon parents that they command their children with the Prayer from the age of seven. Just think how many things a parent must teach the child so that he or she can establish the Prayer: Ablution, Qiblah, Awrah, verses of the Qur’an, supplications in prayer, praying in Jamā’ah, to be submissive before Allah, to be focussed on what one is uttering, etc. All this from the age of seven. This cultivation should extend to learning the Islamic belief, the Pillars of Islam and Imān, and the Seerah. This early education builds a firm foundation for the future. All of this cultivation can be achieved by setting good examples in the Muslim home, through planning and working together as a family and as a community. To reiterate: parents must be loving to their children and the children must feel that love in speech and action; parents must be excellent and virtuous examples; start while your children are young; children must feel a sense of pride for Islam and study the life of the Prophet and his Companions so they can emulate that and defend their Religion; parents need to realise that wherever Islam is maligned, misinterpreted, marginalised and given a lowly position, other cultures will challenge its place in the hearts of the people and they will fall prey to un-Islamic ideologies as we are seeing in our time.